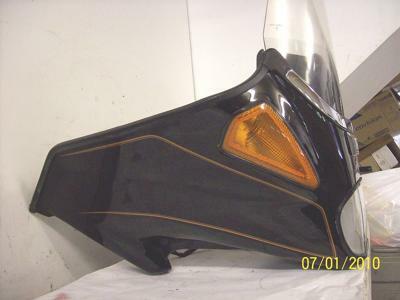 The black 1982 Yamaha Virago 920 Stock Fairing for Sale comes with a key and is in very nice condition. You won't find another used Yamaha motorcycle fairing for sale in this condition in Kansas, on Craigslist or in an Ebay auction so hurry and make an offer before it gets away from you! the 1982 Yamaha Virago fairing is located in Clay Center Kansas and I am asking $300.00 for it.
. If you have any questions or comments you can reach me by email using the space below that has been provided by GoGoCycles Used Motorcycle Parts for Sale (and PLEASE do not neglect to include your contact information in your email or to provide a phone number or email address if you leave a message!) so that I can respond with answers to your questions or after consideration of your best offer as quickly as possible. If you want to buy the 1982 Yamaha Virago 920 Stock Fairing for Sale or have questions send me an e-mail using the comments form found below. is the fairing still available? Did I miss the cost? do you have mounting hardware? how will it be shipped? I am in Berlin/Germany and searching for a manual for this fairing. Can you help please?